Welcome to the new beverage page where we will be showcasing all things liquid. From beer & wine to coffee & tea, if it goes in a glass we will be talking about it here. In addition to the beverages we will also be introducing you to the brands and people behind them. Our first featured mixologist is Julie Hillebrand, Resident Mixologist at J&G Steakhouse at the Phoenician Resort in Scottsdale. Julie got her start in the beverage world at the young age of 18; training on the bar at the Mexican restaurant where she waitressed. She continued to work at restaurants both in the US and in Germany during her college years, picking up a taste for global flavor which she strives to replicate in her drinks. Being hired by Jean-Georges Vongerichten's team in 2008 to start J&G was a great accomplishment for her. Julie was trained by Jason Kosmas and Dushan Zaric, the masterminds behind the world famous New York bars: Employees Only and Macau Trading Company. From them she learned the differences in producing spirits, and the variances within spirit categories from one brand to the next. They also guided her when she began experimenting with making her own infusions and were her inspiration for making bitters at home. As you can tell Julie is no stranger in the kitchen; a skill set that has been very helpful in building cocktails. She is a strong believer in fresher is better and prefers creating her own whenever possible. 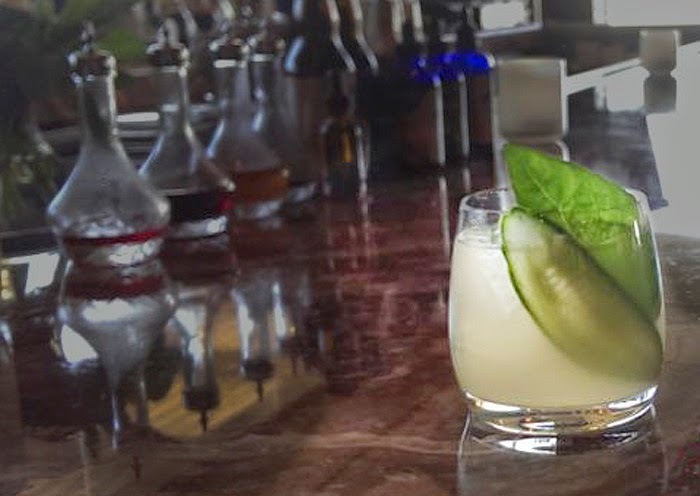 Julie takes advantage of the many farmer's markets around town for fresh produce and herbs which she uses in beverages like the Garden Gimlet below. Making her own lime cordial instead of using commercial brands, which are often filled with preservatives, is just another way Julie commits to freshness in her beverages and it certainly shows in the quality of her drinks. The Garden Gimlet will be featured at J&G starting today! Shake all ingredients, reserving one cucumber slice and a Basil leaf for garnish. Fine strain over fresh ice into a rocks glass. Slide the remaining cucumber strip between the glass and the ice. Slap the last Basil leaf and place it on top. A splash of soda water would be great for texture and hydration on a hot day. Put all ingredients into a sauce pan on medium heat, bring to a simmer. Allow to simmer for five minutes, then remove pan from heat and allow to cool. Fine strain the cordial through a chinois and add an ounce of vodka to help preserve it, if you like. This will keep in the refrigerator for a month. Yum, these sound so fresh! I'd love to try the Fresh Lime Cordial. I've never had one before! Sounds great!